Rover Club of Sweden was formed in 1986 and is a nonprofit organisation for promoting the interest in Rover cars and organizing the people interested in them. 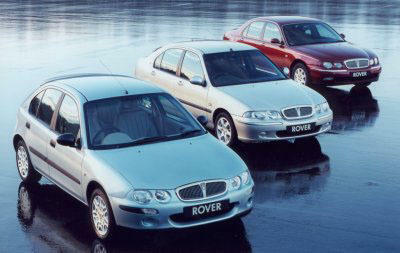 A member of the Rover Club of Sweden may be anyone who owns a Rover or has an interest in Rover cars and any members of their family. The Club's tips for servicing, spare parts and general technical support. Free advertising in our forums. During the 100 years of Rover Cars weekend in the UK a video was taken that have something for all Rover enthusiasts with some marvellous footage covering all models and it includes interviews with owners. 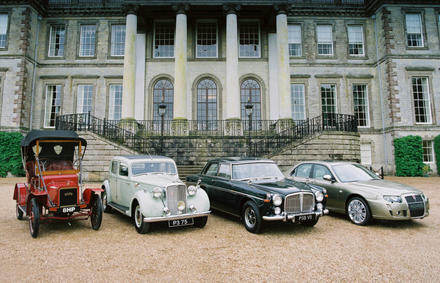 It starts with scenes of the ascent of Sunrising Hill by the 1904 Rover 8 and veteran Rover 6 and 12, with views of Rovers at Upton House, and goes on to the evening event at Gaydon. The main part of the video concentrates on the event at Ragley Hall; There are views of over 400 cars in well ordered ranks of Veteran, Vintage and early thirties Rovers. It has lines of P2, P3, P4, P5 and P6 Rovers. SD1 and Honda era Rovers are well represented as are the 25, 45 and 75. The Video has interviews with owners of a number of vehicles reflecting the range of cars Rover has produced over the past 100 years. The Video is a wonderful souvenir of a unique occasion and is now available in VHS video or DVD. Costs in (GB pounds) including UK post for a VHS video (PAL format) are Video £17, DVD £19. Overseas postage is £2 extra. Use this form to order the video or DVD. Two cabs from Rover. The one to the left is a Nazim from 1929, and at right a Rover 100 from the 1990:ies. 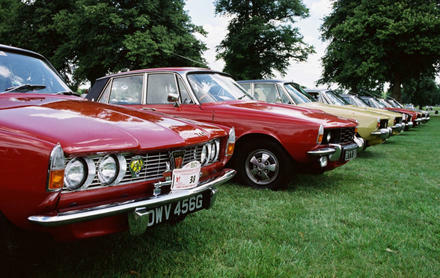 Both these cabs participated in the NTPR-rally in Welch Llangollen in June 2005 where the pictures were shot. ..that The Sargasso Sea is encircled by the The Gulf Stream and the North Equatorial Current, causing the oval-shaped sea to move in a slow, clockwise drift.